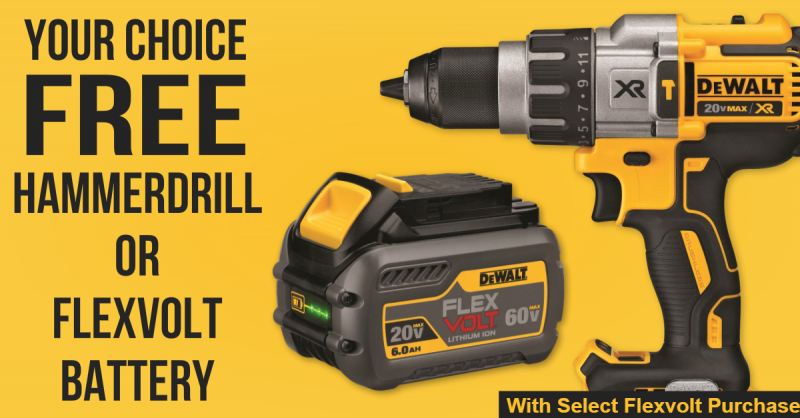 For a limited time at ACME Tools you can get either a Free DeWalt Flexvolt Battery or a DeWalt 20V Max Hammer Drill when you purchase a select DeWalt Flexvolt Cordless Kit. 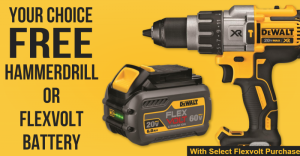 If you are looking for a good opportunity to jump into the DeWalt Flexvolt 20/60V dual-voltage system, now might be the right time. The offer expires at the end of June. DCS575T2 FLEXVOLT 7-1/4In Circular Saw with Brake (2 Batteries & Fast Charger) Kit.